Just as “Fargo” successfully advanced the spirit of the original film without exactly duplicating it, the new variation of “Get Shorty” (Epix, 10 p.m.) takes the spirit of the Elmore Leonard novel made into a popular John Travolta movie in 1995. 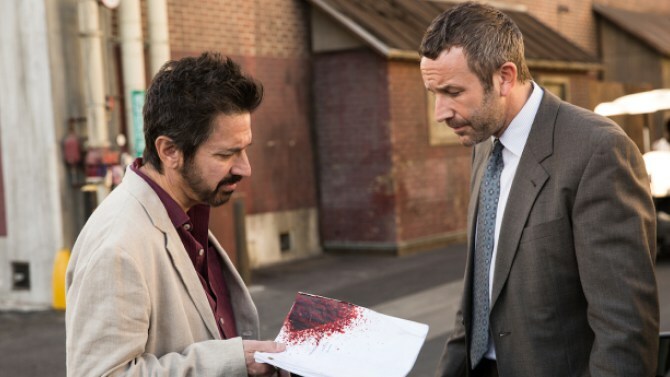 Set in the present day, Chris O’Dowd plays the mob heavy who suddenly gets interested in Hollywood by shopping a script he took from a victim. Ray Romano plays a wild-haired director who is desperate enough to take him up on it. They’re both very good, and it’s fun to see them and the cast creating that blend of mob battles and deadpan humor. For Romano, it’s another stretch to his career that began in comedy and spread to drama. “Well, after ‘[Everybody Loves] Raymond,’ I didn’t want to do a sitcom again,” he said. “I always wanted to keep comedy in my work, but yes, I was more attracted to maybe maybe something dramatic. But it was small. It was little baby steps. Because it’s very hard to get people to forget that character they’ve seen for nine years. “I’m very insecure about all of this, and it’s a learning process. And with each job I get, with each role I take, I kind of discover that I can do something, you know, a little more, a little more dramatic. “When I did ‘Vinyl’ last year, or two years ago, I was delving into something very dark, and I had no idea whether I could pull it off or whether I did pull it off. But there are still plenty of laughs in the series, the best yet for Epix.